Sunflowers are bright, colorful, and beautiful - but they're also an eco-friendly fuel source, a crime deterrent, and a community builder. How can a delicate flower be so powerful? Through the vision of GTECH, fields of sunflowers are making a huge impact that will echo throughout the nation. What began as a graduate study thesis is now an innovative, earth-changing nonprofit organization that is improving communities, creating new jobs, and producing renewable fuel options. Growth Through Energy and Community Health (GTECH) is the brainchild of Carnegie Mellon University graduates, Chris Koch and Andrew Butcher. GTECH's goal is to reclaim vacant land, lots that have often turned into breeding grounds for criminal activity, and transform that space into flourishing renewable crops for biofuel and green opportunity. GTECH's strategy is unique because it goes beyond simply planting. Each location is carefully chosen to bring the most benefit, not only to the crops that will grow, but also to the community it represents. Each project begins with site stabilization, cleaning and reviving abandoned land to improve the soil and add value to the surrounding neighborhood. The projects also engage the community with active involvement, offering educational and training programs, and expand opportunities for social enterprise through new green jobs and community outreach. GTECH began their mission at home, in the Pittsburgh area where more than 4,000 vacant lots are located within the city limits. 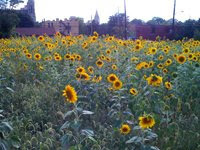 Planting in Larimer was underway in spring of 2008 - a gorgeous bio-energy sunflower garden on a 3/4 acre lot. Harvesting in the fall was a community event with widespread participation. The Almono Brownfield was the second GTECH project, transforming an abandoned and pollutant-causing steel mill into fields of sawgrass, sunflowers, canola, and poplar trees. Project plans also include restoration of an 8-acre community park and educational opportunities to teach area youth about robotic green space maintenance. Similar projects are also planned for the East Liberty community and Lawrenceville.